HubSpot Sales is a smart eCommerce system that helps you sell more in less time, and build and automate sales processes that are specific for your business. In won our Best Sales Software Award for Q1 2018. Designed to meet the needs of various teams and industries, HubSpot Sales is very flexible and easy to customize, and even offers a free startup package for first-time users. Following the good reputation of other HubSpot products, this sales bundle is code-free and simple enough to be used even by inexperienced agents. HubSpot Sales automates all sales-related operations, and saves valuable time at every stage of the funnel. You can use it to automate reminders and follow-up emails without being impersonal, and turn the most repetitive among them into standardized templates you could later use to measure the effects of your performance. Follow up is timely and relevant, as you will immediately be notified whenever a customer opens an email. Another thing that makes HubSpot Sales an attractive on-budget alternative is it being a completely paperless sales pipeline system. You can connect it to your local and online databases in several different ways, and have all data displayed on a dynamic dashboard you can access from any device. The same dashboard tracks critical and records critical metrics concerning your customers’ behavior, which can be of great use when connecting this system to HubSpot’s inbound marketing tool. The tracking history for each contact will be available any time to ensure you can pull off accurate and detailed report, be those based on the system’s standard templates, or custom-created to meet you specific needs. HubSpot Sales should also be shortlisted because of its affordable pricing scheme, which even includes a free plan for small businesses and startup companies. Switching to a paid plan will also be painless, as there is a single plan that costs $50/user/month, and which covers the full suite of advanced sales and marketing features. What is also good to know is that HubSpot Sales is a member of large and well-known productivity software family, and you can purchase it either independently or within a CRM + Marketing Growth Stack. Note that the company’s CRM solution is available for free. The complexity of managing a robust sales pipeline often results in creating unproductive systems that require hours of training. In its attempt to suit the needs of small and developing businesses, HubSpot Sales came up with a modern and very intuitive navigation, and users take almost no time at all to learn how to work with it. Besides, the system is hosted in cloud, and imposes no complex setups and expensive installation fees. HubSpot Sales can help your agents close more deals and will boost your revenue in a significantly less time compared to traditional sales software. You can easily automate outreach, and queue up a sequence of personalized emails without risking to communicate with leads in an impersonal way. All due reminders are delivered automatically, including those sent to you whenever a prospect performs the desired action (opens an email, clicks on a link, and so on). With HubSpot sales, you can create your own personalized email templates, and use the most repetitive among them to measure performance. The system makes it possible to add meeting links to each email, so that your customers wouldn’t miss your calls or fail to open your emails, but rather contact you in a time that is most suitable for them. HubSpot Sales gives you the possibility to keep a close eye on your customers’ behavior. Once all data is entered in the system, you start receiving notifications each time your prospects open their emails, or once they’ve clicked on a link or an attachment. The system will also score them on your behalf, and make sure the hottest leads are kept in the loop. 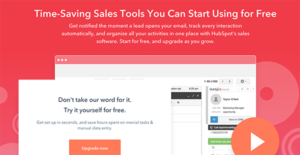 HubSpot Sales also eliminates manual data entry, and does so in several handy ways. You can import your contact bases and have them displayed on your dynamic dashboard, or have critical metrics such as location, contact info, and clicks logged automatically whenever a customer opens an email. If you’re also using HubSpot’s inbound marketing suite, you can also ask visitors to fill a specific contact form, and focus on what is genuinely important for them – closing deals. HubSpot Sales will not only help you manage existent deals, but also drive interest your way. You will have the clear picture of where to promote your products/services, and who’d be most interested in them. This information derives from monitoring who’s visiting and what they’re looking for, so that no prospective buyer would slide through the cracks. Last, but not least, HubSpot Sales is well synced with HubSpot CRM to help you track your sales pipeline, including ongoing, won, and lost deals, and to compare the performance of different agents to reward the best ones. You can also get it in conjunction with HubSpot Marketing, and manage all of your sales and promotion activities from a single account. With features such as these, an affordable pricing scheme, and reliable customer support, HubSpot Sales is definitely a smart investment for every company, be that you’re purchasing it independently, or as part of the company’s Growth Stack. HubSpot Sales blends easily in any software ecosystem, right because it is integrated with a variety of corporate tools and productivity tools. Other than the leading HubSpot products, you can use Sales in synergy with all Microsoft apps; popular CRMs such as Base, Sugar, NetSuite, or Zoho; reliable eCommerce apps and marketplaces, sales management tools, and many more. Note that connectivity may depend on the plan you’ve subscribed for. Another reason for businesses worldwide to choose HubSpot for their sales needs is in-time support. The reliable team of sales professionals will always be there to assist you in need, and you can contact them via phone, email, or live chat. The vendor also offers plenty of guides and training materials, and prides itself with a large user community where you can ask for help or share your experience. Each enterprise has different needs and needs a software that can be customized for their size, type of employees and customers, and the particular industry they are in. For these reasons, no platform can proffer perfect features out-of-the-box. When you try to find a software product, first be sure what you require it for. Read some HubSpot Sales reviews and ask yourself do you need basic tools or do you want advanced features? Are there any industry-specific functionalities that you are seeking? Find the answers to these questions to aid your search. There are multiple aspects that you need to consider and these include your finances, particular business needs, your company size, integration needs etc. Take your time, use a few free trials, and finally choose the system that offers all that you want to enhance your organization competence and productivity. How Much Does HubSpot Sales Cost? We realize that when you make a decision to buy Sales Software it’s important not only to see how experts evaluate it in their reviews, but also to find out if the real people and companies that buy it are actually satisfied with the product. That’s why we’ve created our behavior-based Customer Satisfaction Algorithm™ that gathers customer reviews, comments and HubSpot Sales reviews across a wide range of social media sites. The data is then presented in an easy to digest form showing how many people had positive and negative experience with HubSpot Sales. With that information at hand you should be equipped to make an informed buying decision that you won’t regret. What are HubSpot Sales pricing details? What integrations are available for HubSpot Sales? Pros: I am able to organize everything in the sales process, and to document every interaction with a client. Hubspot Sales makes my job much easier. I don’t know if there is other tool that provides you with the ability to track your sales process in such an efficient way. Our sales team love this software because it is easy to use and it has great integrations that make our marketing efforts smoothly. I love the email tracking feature as well. Cons: Whenever they release new feature we experience some bugs or issues. But, its team always respond to our feedback and they are always willing to help when we experience some issue. Sometimes there is a delay in desktop notifications on the email opens and for website visitors. I thinks more of these issues are because of the browser, and some may be because of the number of the notifications we get. Pros: This tool doesn’t require data entry and allows us to get deeper insight into sales and marketing processes, we are able to provide pre-made libraries of emails, campaigns, presentations and offers. We can easily track which sales tools (emails, slide decks, etc) work best. Cons: The sales adoption was little complicated, because it has different CRM. Thank you for your review! I'm glad to hear you happy you have been with the HubSpot platform! In particular, I am glad to see that you have been happy with the integrations HubSpot has with other software tools. I would love to hear more about which integrations you use and have found the most value from. As for room for improvement - I'd love to hear more about the delays you have been experiencing in getting your notifications for email opens and site visits. Would you mind telling me exactly what browser / extension (chrome or outlook) you are using and what kind of volume of notifications you are getting a day. Please feel free to email carl@hubspot.com if you would like to continue the conversation there! Thank you for the nice review - I'm glad to hear you have been so happy with the HubSpot platform! Thank you for taking the time to write that review - I'm glad to hear how happy you have been with HubSpot Sales! As for room for improvement - I think your idea of being able to turn off repeat notifications for multiple email opens is a great one (sometimes those notifications can even bother me!). I would highly suggest that you put your idea on the HubSpot Ideas forum here: https://community.hubspot.com/t5/HubSpot-Ideas/idb-p/HubSpot_Ideas. Our developers and product managers constantly monitor this forum for ideas on how to make HubSpot better in the future. I took a look on the forum and do not seem to see this idea on there already and I think it would be a great addition. If you do choose to put it on there, feel free to send the link to carl@hubspot.com so I can give it an upvote and a comment! Thank you for your review - I'm glad to hear that HubSpot Sales has helped your organization's sales efforts! As for room for improvement - I'd love to hear more about how the on-boarding process could have been easier for you and your team. Were there any specific issues that you encountered or resources that could have been helpful during this process? Thank you again for the nice review. I love its email templates and the ability to send emails from the CRM along with Sidekick, this is great especially when a new lead or company comes on board. If you need more information about HubSpot Sales or you simply have a question let us know what you need and we’ll forward your request directly to the vendor.